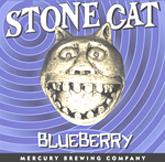 This blueberry ale pours a light amber color with a small, frothy white head. We got two different pours out of this bottle. One was cloudy and the other was clear. Aroma's, of course, of blueberries, but also of buttercreme frosting. Initial flavor is moderately sweet with a light sweet finish. It is light on the mouth with lively carbonation. Dominant blueberry aroma, just from releasing the top. Settles into a pale yellow body with a large frothy head with a lot of activity. The blueberry presence was stronger in the nose than on the taste. The taste was slightly bitter with a blueberry presence, but not sweet -- as we expected.